Cool corner, watercolour painting by Zenera. Digital colorization of an x/f spanking art in watercolor style. 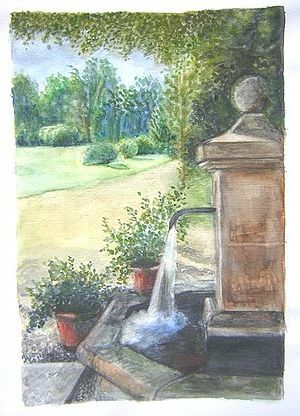 Watercolor (British spelling: watercolour) is a technique for painting where dry pigment is dissolved in water and applied to white paper with a brush. Watercolor artists use a special kind of watercolor paper which is heavier and more resistant to wetness than regular bristol board or writing paper. Colors are generally mixed before they are applied to the paper, but it is also possible to achieve special effects by applying layers of new color on top of existing colors which have already dried, or gradients by letting two different wet colors (or color and plain water) flow together on the paper. Watercolor is transparent, not opaque like acrylics or oil paint, which is why painting in watercolors is always an additive process: any pigment that's on paper will remain visible even if you add other pigments on top of it; in subsequent layers you can make colors only darker but never lighter. Watercolor is well suited to colorize a drawing made with pencil or ink. Natural scenes, still lifes etc. are generally more popular among watercolor artists than people. This is because painting people is better and easier if you can work in additive as well as subtractive steps. Watercolor is relatively rare in spanking art. It is mostly found in book illustrations. Two fine examples are below. Anonymous Hungarian series from about 1925. Illustration for "La Voluptueuse Souffrance" by Frédillo (1924). L'heure bleue by Rajah (probably 2010). water color and pencil sketch by Jameslovebirch (2012). Copy of an R. Crumb ink drawing with changes and watercolor added (Jameslovebirch 2012). Kiri Kelly with bit gag in Sorority Hell Night. (Jameslovebirch, 2012). This page was last edited on 13 January 2016, at 19:30.